This trapping half-court press can be especially effective against teams with mediocre, inexperienced guards. Remember, any trapping defense always carries some risk of giving up the easy weak-side lay-up. Set up as in Diagram A. Two defenders are at the half court line (X1 and X2). X3 and X4 are positioned near the three-point arc. X5 is positioned in the middle near the free throw line. We like to have someone at this position at all times to cut off the center pass. Our guards (X1 and X2) will meet the ball at half-court and try to force him/her to move to one side (away from the middle). As the ball moves to the side, the defenders shift also toward that side (see Diagram A). In this example, the ball is being dribbled toward the right sideline. 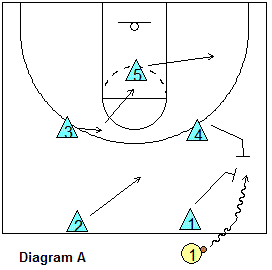 X4 will come up and will stop the sideline penetration, with X1 completing the trap. X2 has dropped down toward the three-point line and X5 moves out a little toward the corner, while X3 moves to the middle (see Diagram B). Notice that we still have a 2-2-1 configuration at this point. X2 and X5 try to position themselves in the gap between two offensive players, and are concentrating on the pass interception. X3 moves in front of any offensive player that moves into the center at the free throw line, and denies that pass. See diagram C. If the ball is passed across court to the opposite sideline, X2 and X3 should create the trap, with X1 moving to the top of the three-point arc (X2's former position), X5 moving to the ball-side, and X4 moving quickly to the middle (X3's previous position). If the ball is passed into the corner (Diagram D), X5 will move out to cover it, while X4 will move to the ball-side low block. At this point, I would move into either your man-to-man defense or a standard zone defense, such as a 1-2-2 zone. You can continue trapping using this zone defense, as outlined on that page.